Deluxe, 16-foot, mahogany, canopy bar, originally designed and built by Wooden Nickel Antiques, in 1999. 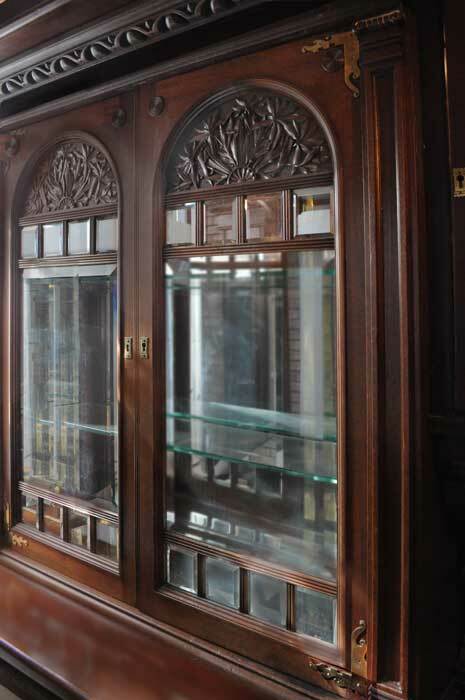 This exquisite mahogany bar was constructed using many carved antique components. The main bar features a round, beveled, center mirror; also curved, leaded cabinets, glass cabinet shelves, and carved, beveled-glass cabinets on each side. There are multiple beveled mirrors throughout the bar and on columns, and crown. In addition, the canopy interior features a triple-coffered, copper ceiling with a crackled-glass overhead globe lamp, and the top of the canopy includes a large, rolled crown. Design and structural details of the front bar include carved, mirrored panels, brass capitals, and a brass footrail.